The question that has been on everyone’s mind is: “Which array will Veeam integrate with next?” Well, we are happy to announce that Veeam Availability Suite v9 will integrate with EMC storage. This is a big deal, as this announcement really includes two different array families and scores of configuration possibilities. Both the EMC VNX and EMC VNXe families of arrays are supported. 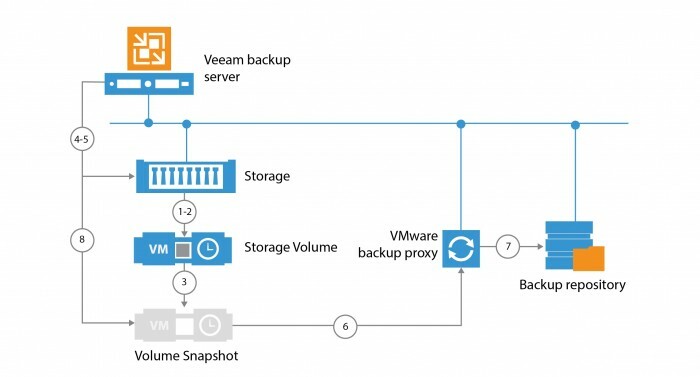 This integration is also powerful as it includes both the Veeam Explorer for Storage Snapshots recovery technique and Backup from Storage snapshots. Leveraging storage snapshots is the natural choice to deliver Availability for the Modern Data Center as we can take backups from storage snapshots up to 20x faster than the competition. Couple that with the restore capabilities of Veeam Explorer for Storage Snapshots (which is included in Veeam Backup Free Edition by the way!) and your data center is ready for anything. There must be a good snapshot engine on the array. Quite simply, we don’t want to build great availability features around an inferior snapshot engine. There must be large market share. We want to provide solutions for the market and have it be used, it doesn’t make sense to build awesome technology that few would use. We need close cooperation from the storage vendor. It’s a business endeavor and Veeam commits resources to developing the storage plug-ins for integration with storage; and we’ll need their engagement to promote this great technology. Leveraging the storage snapshots for restores are indeed handy and help deliver the best recovery time objectives. It’s still recommended to have a proper backup on different storage however. That’s where Backup from Storage Snapshots comes into play. Integration with EMC storage will be a big hit to our joint customers, partners and prospects. Veeam Availability Suite v9 is coming soon in Q3 this year (that’s right from Gostev!). I’d expect that like previous major releases we’ll have betas so you can test drive this incredible new functionality yourself. The Veeam Forums weekly digest will be the place to see that when the time is right, but until then you can sign up to be the first to know when v9 is available.